Titanium Ion Technology White & Red Baseball Bracelets / Wristbands - Softball & Baseball Jewelry, etc. 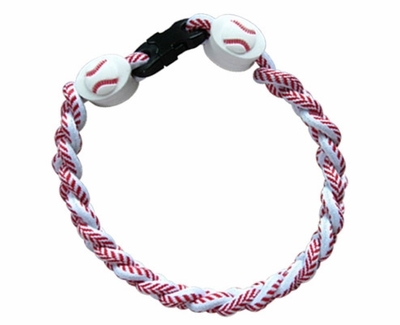 These Baseball Ionic Bracelet Wristbands feature White and Red cords with lace stitching braided together into a 9" long bracelet, with rubber Baseball knobs on each end. Perfect for Guys or Girls looking to gain a competitive edge! Ionic Baseball Bracelet / Wristband will retain it's ION producing properties even when washed or wet.